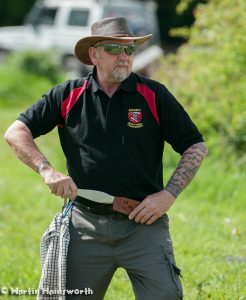 First time I threw a knife was at a juggling convention back in 2010 and the person who showed me how was Richard Sunderland. Didn’t try again until a few years later at another juggling convention in 2014 and this time it was John Taylor who was the instructor . 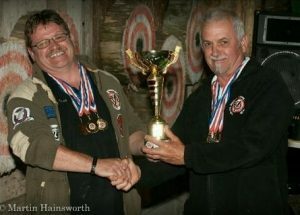 The following year at the same juggling convention John Taylor was again showing people how to throw but this time something got me hooked. I purchased some J.T. 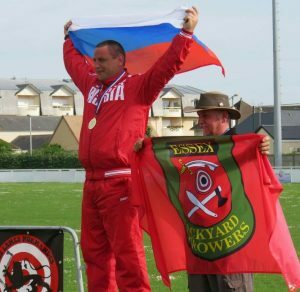 Throwers and on returning home sorted out a target and practiced as often as I could. Eventually a few of our juggling club members became interested and we set up a small portable range which we took to various places. 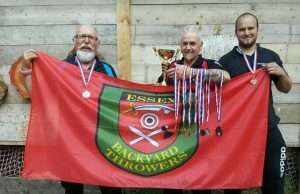 We then decided to look for a venue to set up a permanent range and was lucky enough to be contacted by Terry Longhurst and Essex Backyard Throwers was born in Aug 2016.